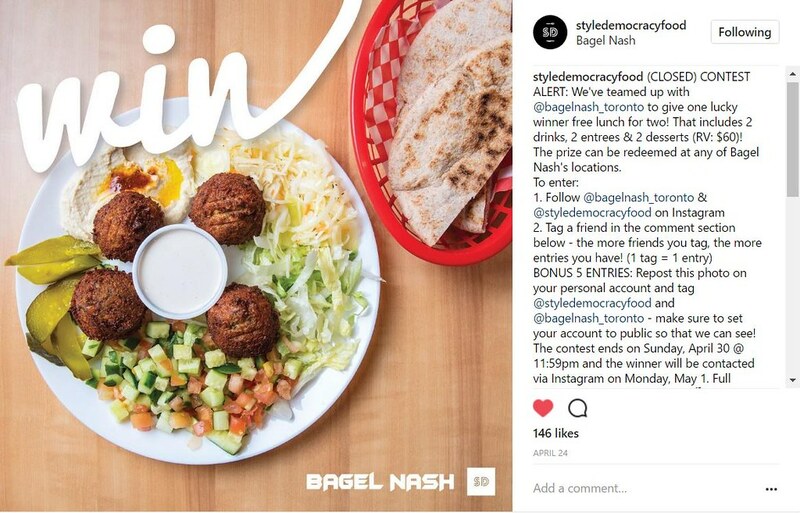 More than a month ago, I entered a contest on Instagram courtesy of styledemocracyfood to win a chance to dine at Bagel Nash for myself and a friend. 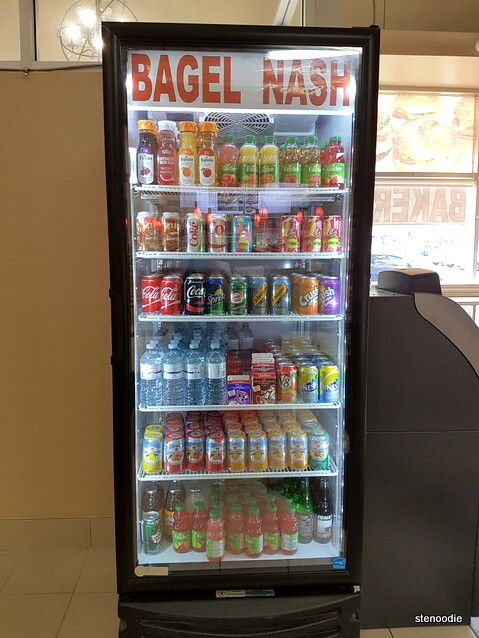 I was lucky enough to be chosen and thus was finally able to redeem this prize of two drinks, two entrees, and two desserts at this bagel franchise last Friday. 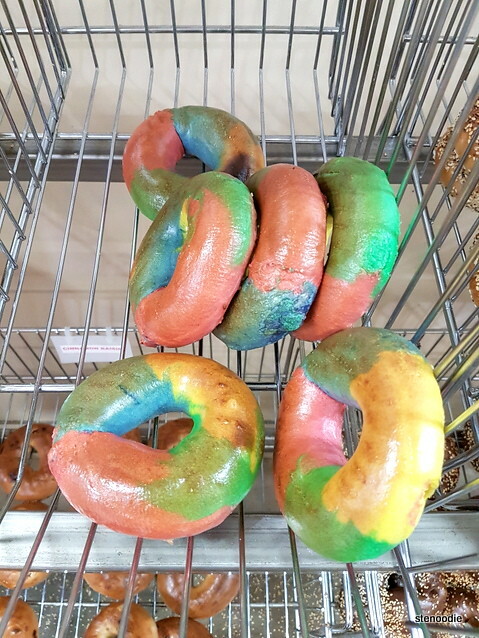 On their Instagram contest page, it clearly says that the prize could be redeemed at “any location of Bagel Nash” — there are three locations in the Greater Toronto Area. 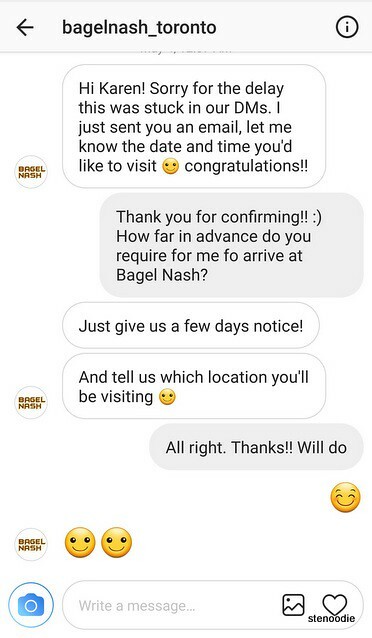 Thus, when I contacted the contest holder and then the representative for Bagel Nash about claiming this prize, I was asked which location I wanted to visit to claim the prize and also which time and date I wanted to go to. Soon, the location, time, and date were set. 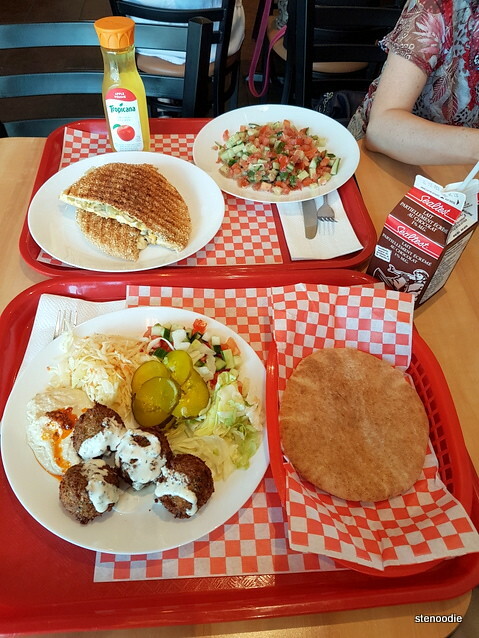 Thus, this past Friday for lunch, my mom and I went to the closest location of Bayview Avenue and John Street to claim this lunch prize. I was instructed to ask for Simon when I got there. 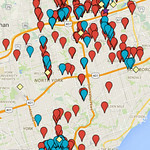 I was well familiar with this location of Bayview and John, having passed by there before on many occasions. 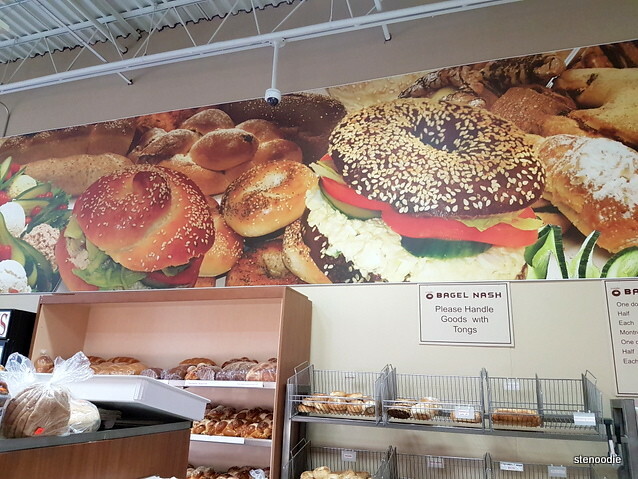 When I entered, I saw and smelled the aroma of the freshly baked bagels from their kitchen and was excited to choose something for lunch as the prize to try. 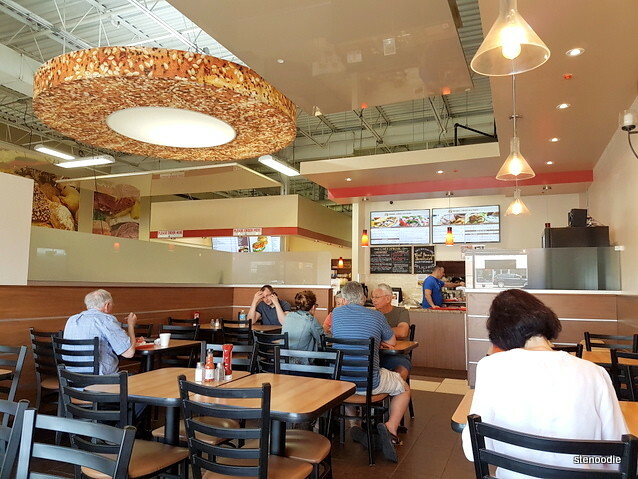 However, when I approached one of the staff members to ask for Simon, I was informed that Simon didn’t work at this location but that he worked at the Steeles and Dufferin location. I was surprised and dumbfounded because I had clearly been informed to ask for Simon at this location. Someone asked me if I wanted to talk to Simon’s father-in-law instead and I said sure. However, once I spoke to this elderly gentleman, it was evident that he knew nothing about the prize or what I was talking about (cue awkward situation). I was started to feel frustrated because it is one of my pet peeves to have miscommunication about these prize redemptions. It’s not like I want to make anyone’s lives more difficult by trying to claim my prize but when I have to go around in circles in order to get to the right person, it really adds some level of stress to my otherwise well-planned day. 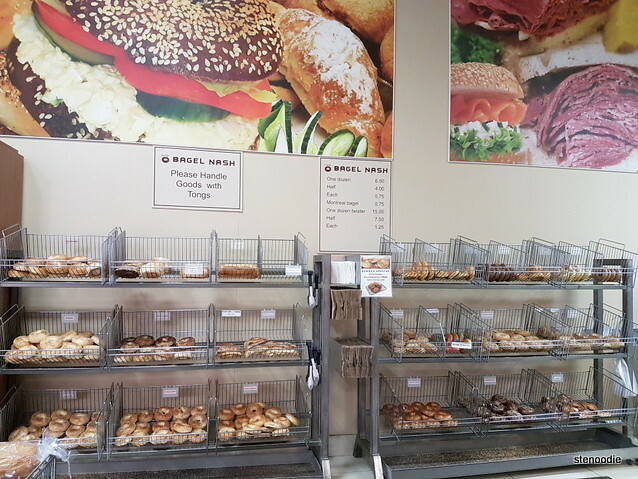 As I stood outside the bakery with my mom to urgently e-mail the representative for Bagel Nash about the situation, a woman appeared shortly and addressed me. 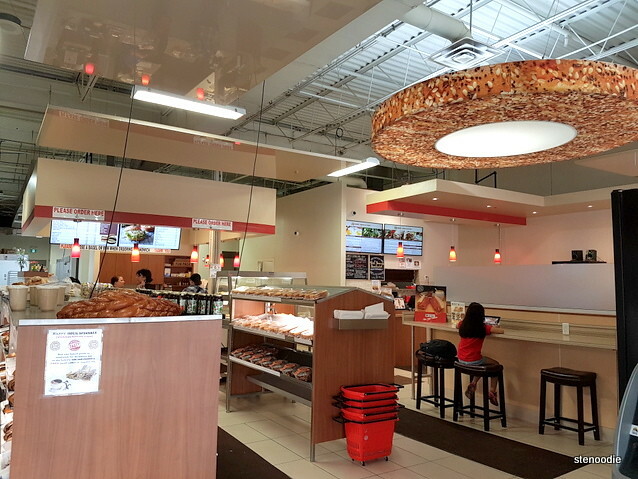 She informed me that Simon does not work at the Bayview location and that the prize must be claimed at the Dufferin and Steeles location because that location actually had an eatery. However, in my defense, in my communications with the representative for Bagel Nash, I was clearly asked about which location I wanted to attend (see above screenshot again)! Why was it out of the blue that this new information was given to me? 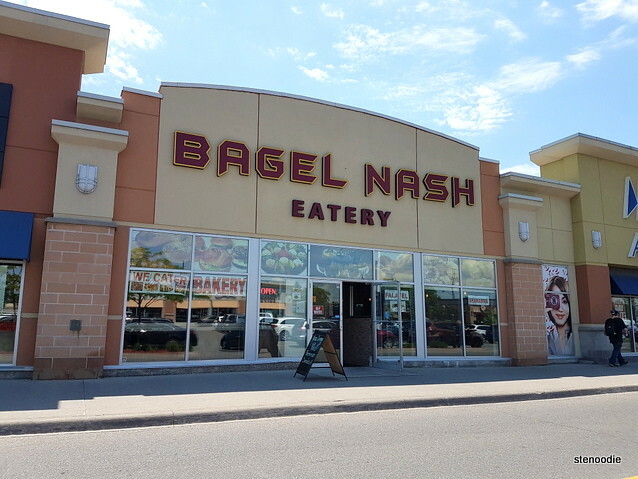 In any case (and long story short), I finally made it to the Dufferin and Steeles location of Bagel Nash (which was a definitely larger store than the other locations) at 1 p.m., an hour after my initial intended lunch. 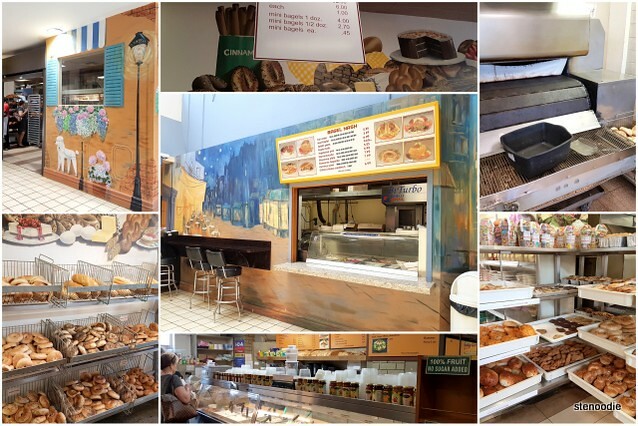 Upon walking into the restaurant, I saw that they had a large bakery section for their baked goods as well as a definite eatery/restaurant section intended for hot lunches, breakfasts, and snacks. It was a really nice interior as there were lots of tables and seating for people to enjoy their store-bought goods or food from the eatery. I approached the counter and the gentleman manning the cashier was Simon himself. 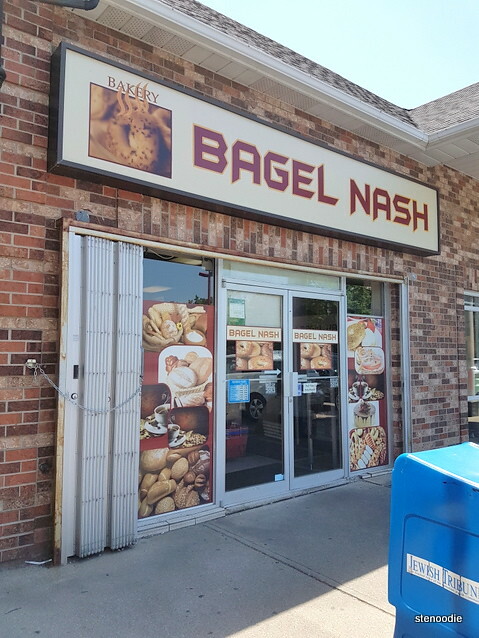 We shook hands and I introduced myself to him (the representative for Bagel Nash was kind enough to e-mail me and tell me that Simon was waiting for and expecting me since they hadn’t heard from me and wanted to see if I had any trouble finding my way to the Dufferin store). At the moment, although I was initially frustrated, I knew that there was nothing I could do about the situation because there was obviously a miscommunication to the representative and the contest page from styledemocracyfood about the location selections. As much as I was inconvenienced, I couldn’t let that affect me especially since it was a comped meal and Simon was very friendly, open, and carefree. I did let him know about the mistake though and he did acknowledge that the contest page needed to be amended then. In any case, we were hungry and so ready to eat! 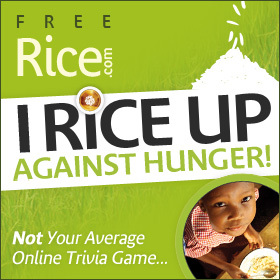 I took a look at the full menu and was curious about many of the items on there. There were a lot of lunch and breakfast items to choose from! 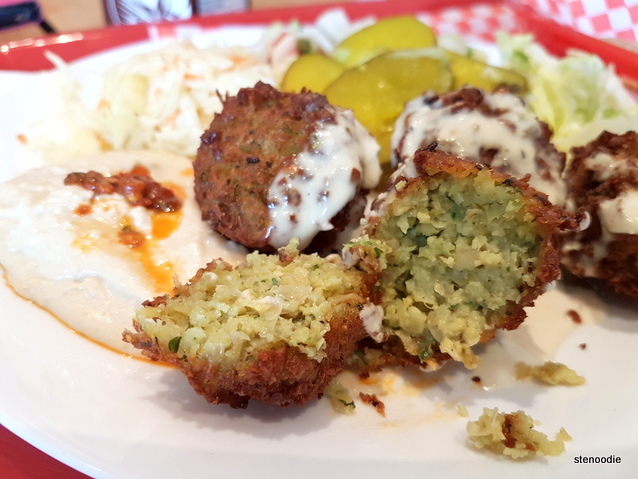 Although I was first curious about the new veal parmesan burger, I decided to consult Simon on their best sellers and popular items. 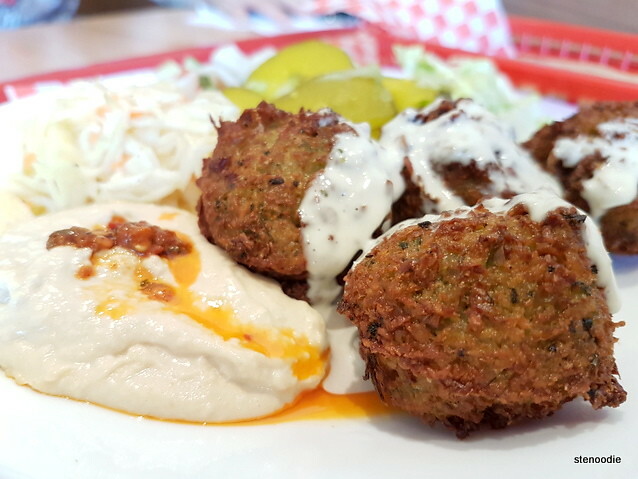 He recommended their falafels to me (saying that they have skyrocketed to first place in sales recently), their sharwarmas, and their grilled cheese bagel sandwich. 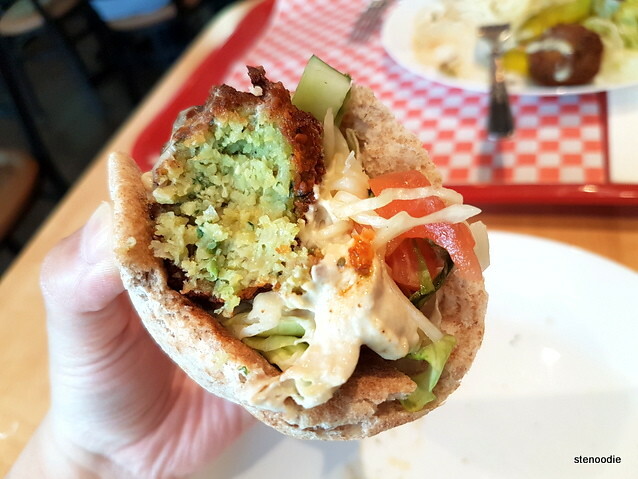 I decided on ordering the falafel (on a plate — again, based on Simon’s expert recommendation) and the grilled cheese bagel sandwich for my mom and I. 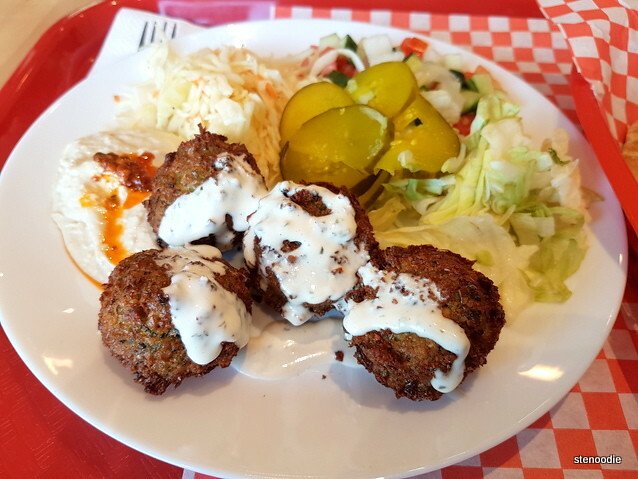 The falalel plate came with a pita bread with all the works — humus, cabbage, tomato and cucumber salad, pickles. 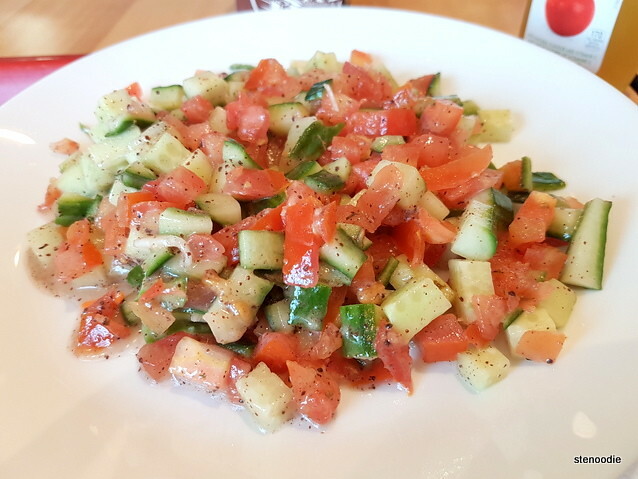 The grilled cheese bagel sandwich came with a tomato and cucumber salad with dressing. The prize included two drinks as well so we chose a chocolate milk and apple juice from the fridge. When the order was ready, Simon called me up to collect my tray and we were able to enjoy a quiet and casual lunch at one of their tables inside the restaurant. The grilled cheese bagel sandwich (Nash Grilled Cheese) was so good!!! 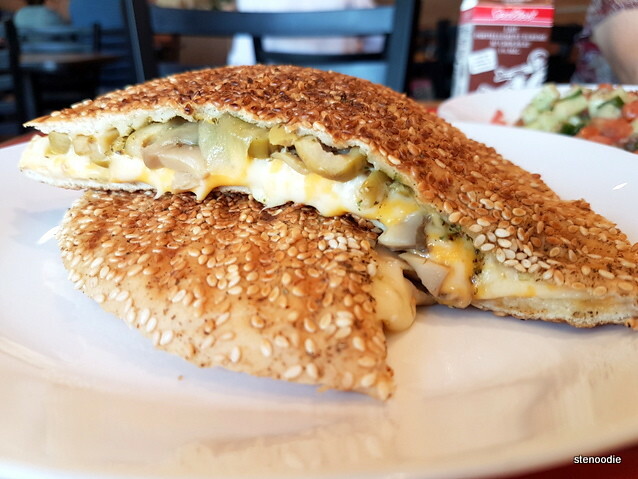 I have never had a bagel sandwich like this where there was no hole in the bagel — which is what a traditional Jerusalem bagel must be. 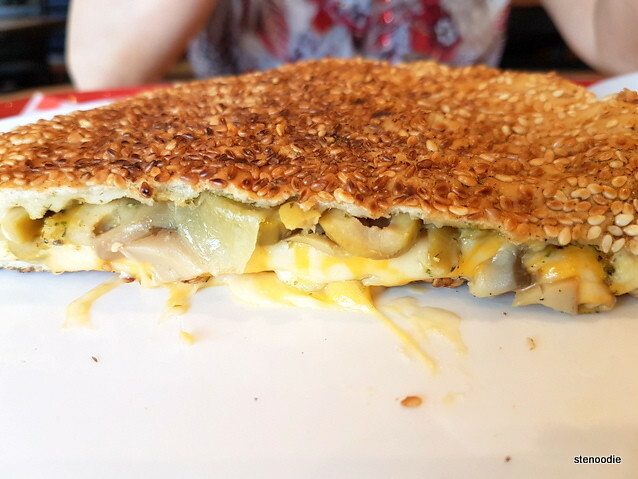 Instead, it was a flat bagel and within the gooey melted cheese, there were olives, onions, and mushrooms. It was such a great combination! When ordering, Simon had asked me what I wanted in this sandwich and I kept everything except tomatoes (I didn’t want a soggy sandwich since that’s what tomatoes usually tend to do). I loved this Nash Grilled Cheese and would definitely recommend it if you go. It was so warm and perfectly grilled. The bagel itself was good too; thinly sliced with lots of sesame seeds. We took our time eating and by the time we finished everything, we were quite full. However, we still had the dessert portion to try! Again, I asked Simon for his recommendations. 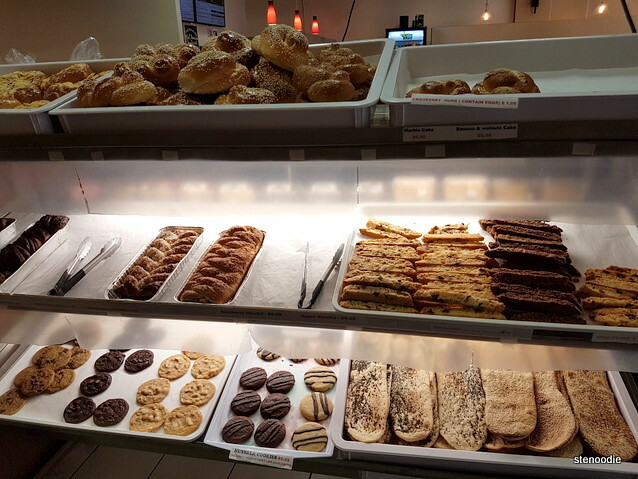 He showed us the sweet baked goods section of the store where there were a huge variety of chocolate croissants, sweet pretzels, buffalo buns (in chocolate or poppy seeds), cookies, and more. I had spotted the huge Buffalo Buns in the store earlier and was highly intrigued about these so I asked to try the Chocolate Buffalo Bun as well as the Sweet Pretzel. Both my mom and I were full but we couldn’t leave the store without trying at least a bite of the desserts while they were still fresh. 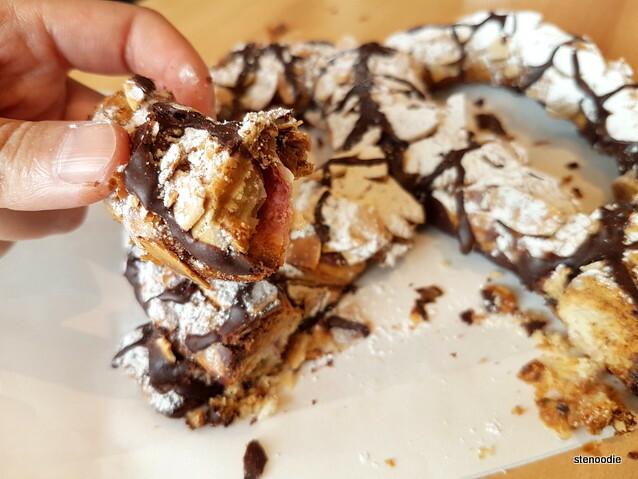 The Sweet Pretzel was a gigantic pretzel (as big as my face) and covered with chocolate and almonds. I cut apart a bit to try and it was very decadent and rich. 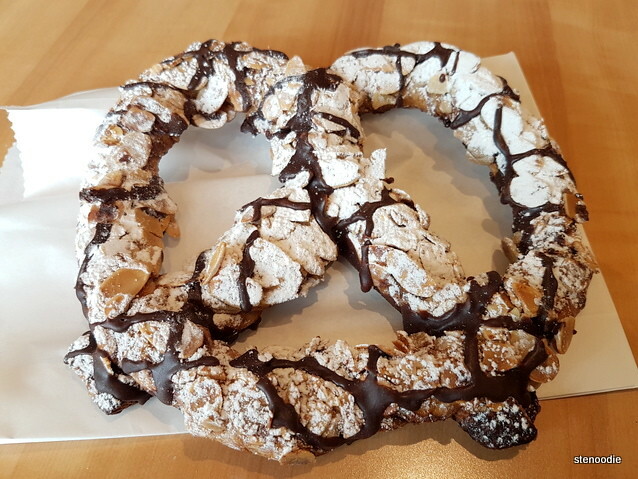 Anyone who likes almonds and a solid pretzel will enjoy this. The Chocolate Buffalo Bun was like nothing I’ve had ever before. First of all, it was very weighty! It was like holding an adult red-eared slider turtle in your hands since it was so heavy (I make the comparison to such turtles because my pet turtles at home weigh about the same as that dessert bun!). 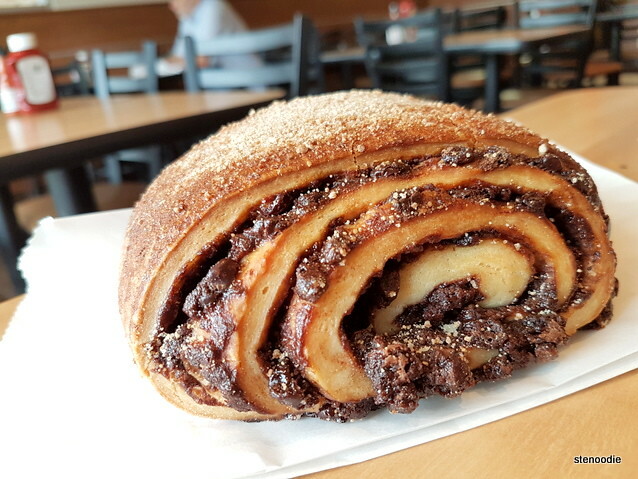 The Chocolate Buffalo Bun was intricately made with layers of pastry and chocolate. It was also very rich and decadent! 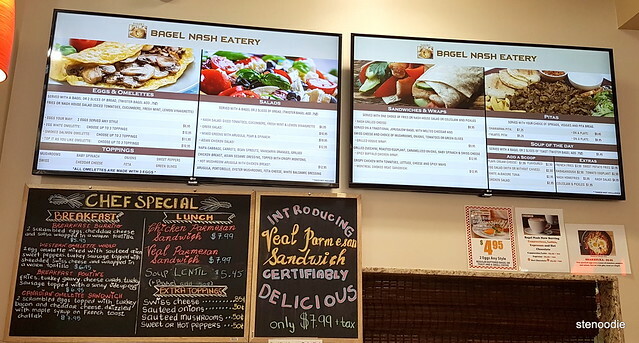 I have to thank styledemocracyfood for giving me the opportunity to try out Bagel Nash’s lunch menu for free upon winning their contest. If I wasn’t picked as a winner randomly, I would probably not venture into a Bagel Nash for lunch any time soon. 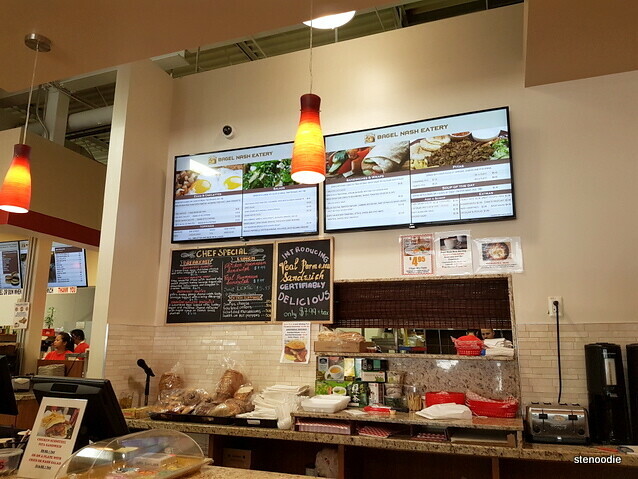 Now, I can say that their lunch — especially that grilled cheese bagel sandwich — is definitely worth trying! 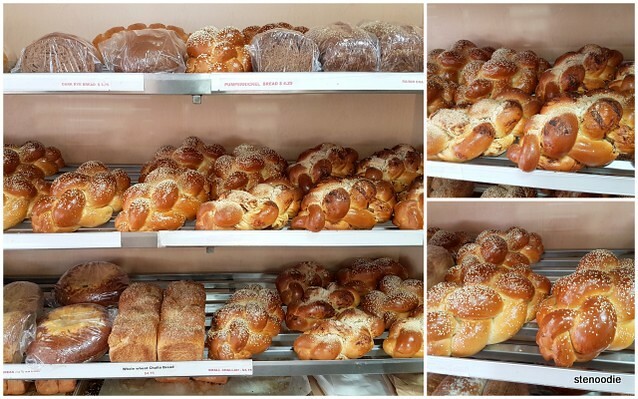 What are these giant breads called? 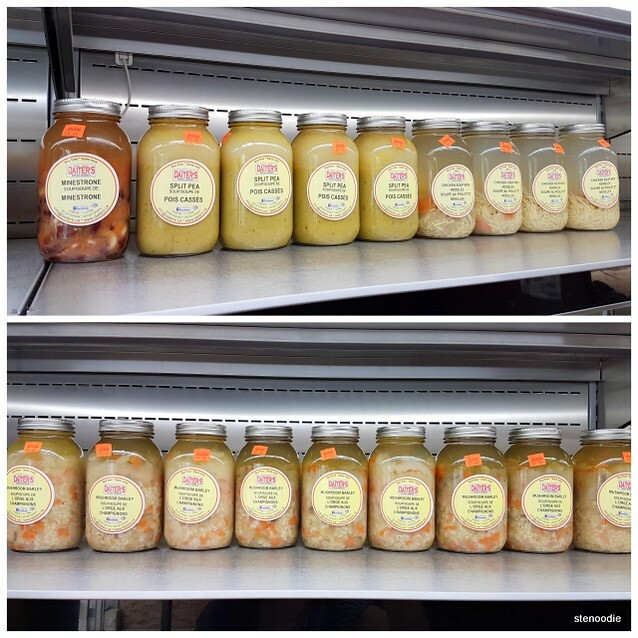 They also have precanned soup available for purchase! FTC Disclaimer: Although Bagel Nash provided the meal free of charge via winning an online contest, the opinions expressed here represent my own and not those of the contest holder or company. 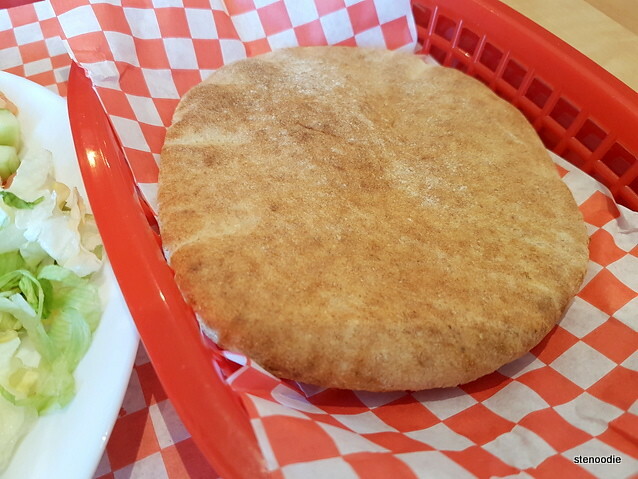 This entry was posted in Complimentary Adventures, Food and tagged 81 Gerry Fitzgerald Dr, Bagel Nash, Bagel Nash dessert selection, Bagel Nash Dufferin and Steeles, Bagel Nash Dufferin eatery, Bagel Nash eatery, Bagel Nash falafels, Bagel Nash North York location, Bagel Nash North York menu, bagels in Toronto, Buffalo Buns, Chocolate Buffalo Bun, Falafel on a pita, Falafel Pita on a Plate, falafels and hummus, food blog, foodie, Giant pretzel with chocolate and almonds, good falafels Toronto, instagram prize redemption stories, lunch, Nash Grilled Cheese, North York, restaurant review, Riocan Marketplace, Sweet Pretzel, Toronto. Bookmark the permalink.